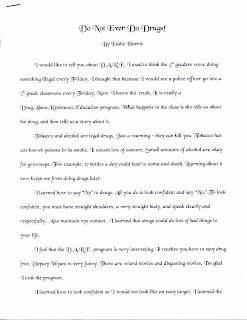 Eddie did a nice job on his DARE report. I really enjoyed reading it when I got back from Chicago. He also got a perfect score on his science fair project. He was pretty proud of that, since he worked so hard on it mostly by himself. Excellent report Eddie! I hope you stay strong & away from tobacco, alcohol & drugs! You will have a happier & more successful life if you do! Your Dad knows some people who didn't & they had very bad lives. Congratulations on the great grade on your science fair project!